In 2018, nearly one-third of UC San Diego’s admitted 38,954 new freshmen and transfer students were the first in their family to attend a four-year college. Photo by Elena Zhukova. In a recent listing published by The Chronicle of Higher Education, the University of California San Diego is ranked 14th among the nation’s top 20 four-year public institutions that raised the most in private donations in the 2018 fiscal year, and in turn, gave institutional grant aid to nearly half of their students. The average amount the top 20 gave per student was about double that of four-year public institutions over all. Thanks to the Chancellor’s Associates Scholarship which ensures access and affordability for qualified local students from low-income backgrounds, Hector Enriquez began his studies at his dream school—UC San Diego—in the fall of 2018. Hector is one of many who have benefited from generous philanthropic support donated last year to the Campaign for UC San Diego, a fundraising effort launched in 2012 that has reached 90 percent of its $2 billion goal. 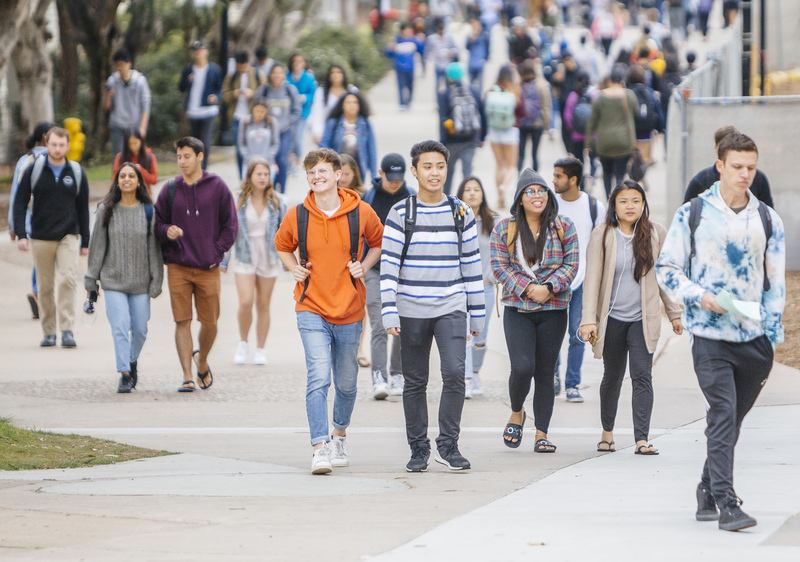 In 2018, UC San Diego admitted 38,954 new freshmen and transfer students, with nearly one-third of the campus’s diverse admitted class the first in their family to attend a four-year college. The Chronicle of Higher Education’s list, “How Generous Are the Colleges to Which Donors Are Most Generous?” can be accessed here. At the University of California San Diego, challenging convention is our most cherished tradition. As one of the top 15 research universities in the world, UC San Diego is blazing a path to a better future. The Campaign for UC San Diego comprehensive fundraising effort will transform the student experience, our campus, and ultimately the world. With philanthropic partnership, we will continue the nontradition as we impact lives here and across the globe. Learn more at campaign.ucsd.edu.